17 June TODAY it starts. WELCOME to the ESM 2018 Conference! 12 June The Abstract book has been published. 5 June Find an updated programme here. 5 June Podcast by Taina Pennanen and Johanna Vilkki: Good microbes effect on everything and they should be respected. New reasearh results open the significance of microbes. Published in Finnish. Suomenkielinen podcast, jossa Taina Pennanen ja Johanna Vilkki kertovat, miten hyvät mikrobit pyörittävät maailmaa. Niitä kannattaisi kunnioittaa ja hyödyntää. Kuuntele. 29 May What can I do in Helsinki? Activities you will find here. 16 May Instructions for presenters you will find here. 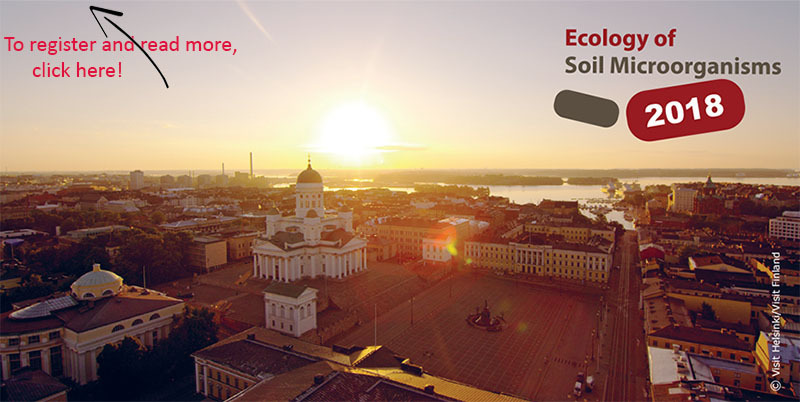 We are pleased to welcome you to the third conference on the Ecology of Soil Microorganisms to be held in Helsinki, Finland in June 2018. The previous two meetings organised in Prague in 2011 and 2015 attracted almost 500 participants from all over the world. The ESM conference is an interdisciplinary platform addressing questions related to individual microbes (bacteria, fungi, archaea, protozoa and viruses), microbial communities and their ecological networks. Modern genomic, transcriptomic and proteomic methods are linked with approaches based on soil chemical, biochemical and functional analyses, exploration of soil fauna and plant ecology. We cordially invite experts from all these disciplines to join us in Helsinki to promote state-of the art research in the field of soil ecology and enjoy the northern midsummer madness! We are seeking for scientific contributions concerning carbon and nutrient cycling, decomposition, interactions of organisms, priming, climate/environmental change, microbial diversity and functions in all ecosystems, and particularly in the arctic and peatlands. Sign up by emailing microbes@luke.fi and ensure that you get the latest updates and timely information from ESM organizing committee.